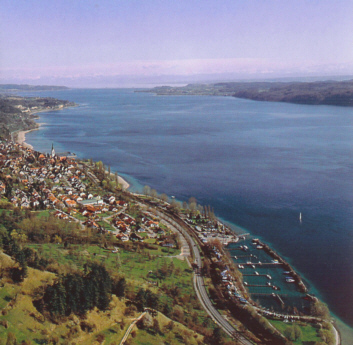 Airtravel: The Lake of Constance area is serviced by various airlines through the international airports of Friedrichshafen (about 30 minutes driving distance from Sipplingen) and Zurich (Zurich in Switzerland is about 50 minutes driving distance from Sipplingen). Tickets can be booked through travel agents, flight schedules and more information is also available on the airports' websites. For an up-to-date list of budget carriers consult www.whichbudget.com. There are car rentals at both airports and the airports can easily be reached by public transportation. Bicycle: The Lake of Constance and the surroundings of Sipplingen in particular offer fantastic opportunities for cycling. "Villa Alpenblick" will be a great starting or ending point for your trip. Or why not break your journey in the middle for a relaxing stopover week at the Villa? Sipplingen from the view of a Zeppelin NT passenger.